Purchase both Total Retriever Training and Total Retriever Marking and receive $30.00 off the price. Includes s/h in the U.S. 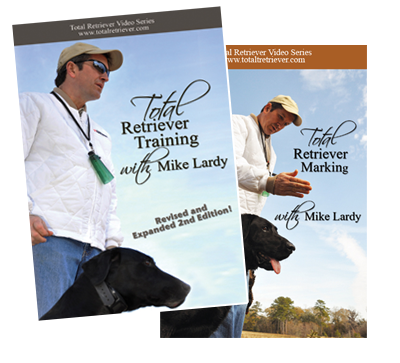 The 2nd Edition of Total Retriever Training includes the best of the original with the addition of all new material. 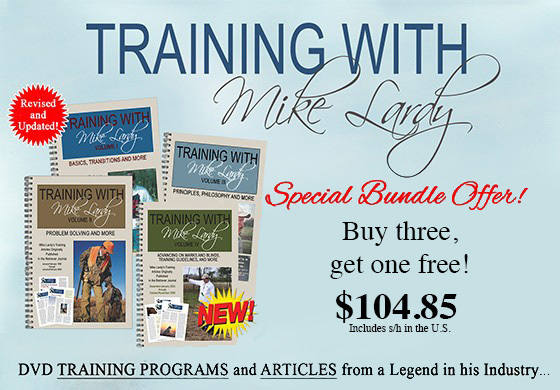 Like the original, this video takes you step by step through training methods that Mike Lardy uses to produce consistent winners. Mike shows you how to train your retriever from basic through advanced training. Fireside discussions with Mike Lardy expand on the marking concepts in each tape. These discussions cover commonly asked questions from both FIELD TRIAL and HUNT TEST perspectives. An accompanying manual includes introductory remarks, clarifying comments, definitions, diagrams and detailed information on various topics. The manual supports the tapes and details important concepts in sidebars throughout the manual. Includes both titled. A total of 9 DVDS with over 11 hours of instruction plus 2 manuals.